For John Simmons, comptroller of what was once Britain's largest catering company, J Lyons & Co, there was only one option available to take advantage of the huge benefits offered by electronic calculating machines: Lyons must build its own. It was 1947. No such machine was commercially available in the UK, and the costs of buying an American machine would be prohibitive. On 20 October that year, Simmons presented a proposal prepared by two of his lieutenants, Raymond Thompson and Oliver Standingford, to the Lyons board. In his introduction, Simmons wrote, "Here, for the first time, there is a possibility of a machine that will be able to cope, at almost incredible speed, with any variation in clerical procedure. "What effect such a machine could have on the semi-repetitive work of the office needs only the slightest effort of imagination." A little more than four years later, Leo (Lyons Electronic Office) took over a weekly task called bakery valuations from human clerks, and so became the first computer in the world to run a routine office job. In later years, as Leo Computers went into business as a computer supplier, competitors had fun with the notion that a purveyor of tea and cakes might claim a place at the cutting edge of office technology. But to anyone who knew how Lyons worked, it should not have come as a surprise. With a chain of teashops that had grown to 250 by the 1930s and several restaurants and hotels, Lyons had always been ahead of the game in factory automation and time-and-motion-based "scientific management". In 1923, it hired Simmons, a top Cambridge mathematics graduate, to apply the same rigour to its back-office operations. Closely following the victory celebrations after the Second World War came news that American scientists had built an "electronic brain" - Eniac - to carry out ballistics calculations. When Simmons sent Thompson and Standingford on a fact-finding tour of the US in 1947, they talked to the elite group of engineers and mathematicians who were taking the next steps in electronic calculation. On the voyage home, the two men drafted their report to the board, showing how a machine designed to do mathematics could also write form letters, issue invoices and produce payslips. Their most important discovery was that Cambridge University was building its own machine, the 3,000-valve Electronic Delay Storage Automatic Calculator (Edsac). Impressed by its designer, Maurice Wilkes, Lyons decided to fund Edsac's development. The 1947 agreement, sealed with a handshake, gave Cambridge £3,000 in return for permission for Lyons to build its own copy of the machine if it worked. In 1949, Edsac ran its first program, and Lyons began to build Leo, its engineers inventing as they went along the much more demanding input and output devices it would need for commercial operations. Leo was soon in demand as a bureau service for other clients: payroll for Ford, classified work for the Ministry of Defence, tax tables for the Inland Revenue. Lyons needed a second machine for its own use. The higher management at Lyons asked the obvious question: why not make more machines for sale, specialising in office applications? The company founded Leo Computers in 1954. At the time, there was little competition in the UK market, with Ferranti the closest competitor, but mainly supplying scientific users. Still valve-based, Leo II was not much of an advance on Leo I and only nine were sold. In 1962 Leo III, a transistor-based machine with some truly innovative features, came into operation. Eventually, there were about 60 Leo III installations worldwide, and the last did not come out of service until 1981. But even as it realised the full glory of its technological achievement, Leo Computers faced commercial eclipse. Always a source of financial anxiety to the Lyons board, it was sold to English Electric in 1964. By 1968, with IBM now spending more on research and development alone than the combined turnover of the half-dozen or so British computer manufacturers, they merged - under pressure from the Ministry of Technology - to form a single company, ICL. Leo's early success owed less to its hardware than to its highly innovative systems-oriented approach to programming, devised and led by David Caminer. The Leo consultants who sold the machines designed bespoke systems for their clients, beginning with a detailed analysis of the task at hand. Although this led to excellent customer satisfaction, it was a poor business model, as the services of consultants were never costed. Higher sales might have brought in more resources, but Leo had to fight a management culture whose response to new technology ranged from suspicious to indifferent. Speaking in 1958, Lord Halsbury, director of the National Research Development Corporation, said, "The American user has supported the American computer manufacturer consistently and enthusiastically In Britain, he has hung back, waiting to see a new idea tried out." 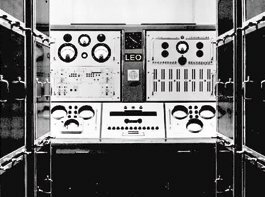 The application of computing at Lyons in the early 1950s was the most advanced of its kind in the world, but ultimately Leo could not hold its position in the face of greater commercial and government investment in the US firms that caught up all too soon. More research and development, more technologically literate boardrooms, more government horizon-scanning: these are just some of the fixes that might help Britain avoid a similar abdication of technological advantage in future. The greatest tragedy in Leo's loss was the extinction of a sales philosophy based on the needs of each user. Expensive it may have been, but not half as expensive as the catastrophic failures that have too often resulted from a one-size-fits-all approach.